August 06 Sunday is the anniversary of the Hiroshima nuclear blast: 72 years to the day that an entire city was incinerated at the push of a button. And what’s even more terrifying is that nuclear weapons today are far more powerful than the ones that were used to bomb Japan in 1945. 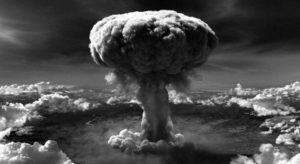 With nearly 200,000 dead in the wake of the Hiroshima and Nagasaki atomic bombings, it is clear that the world cannot afford to let a nuclear disaster happen ever again. All nuclear weapons require a primary nuclear explosive. There are only two materials that are used for that purpose: either Highly Enriched Uranium (HEU), plutonium of any kind (except plutonium-238). Highly Enriched Uranium refers to any kind of uranium that has a relatively high percentage (20 percent or more) of uranium-235. Natural uranium – uranium that is mined from the Earth anywhere in the world – has only 0.7 percent uranium-235 and 99.3 percent uranium-238. Uranium-238 is not usable as a primary nuclear explosive material. The mix of U-238 and U-235 found in natural uranium is also not nuclear-weapons-usable, because there isn’t enough U-235. Uranium enrichment is a process of gradually removing more and more U-238 from the mix, thereby increasing the concentration of U-235, boosting the percentage of U-235 to 3 percent, or 5 percent, or 20 percent, or 90 percent or more. Any uranium that is over 90 percent U-235 is called “weapons-grade uranium” and is ideal for making atomic bombs. But in fact any uranium that is over 20 percent U-235 is said to be “highly enriched” HEU and can, in principle, be used to make a nuclear explosive device. Plutonium does not exist in nature; it is a uranium derivative that is created inside a nuclear reactor. Specifically, when a uranium-238 atom absorbs a stray neutron inside the reactor it is transmuted into a plutonium-239 atom. Further neutron captures produce other, heavier plutonium isotopes: plutonium-240, -241, -242, et cetera. All of these reactor-produced plutonium isotopes are usable as a primary nuclear explosive, but the best of the lot (for weapons purposes) is plutonium-239. Any plutonium that has a very high percentage of plutonium-239 is called “weapons-grade plutonium”. Nevertheless, all reactor-produced plutonium is perfectly weapons-usable, regardless of the concentration of plutonium-239. 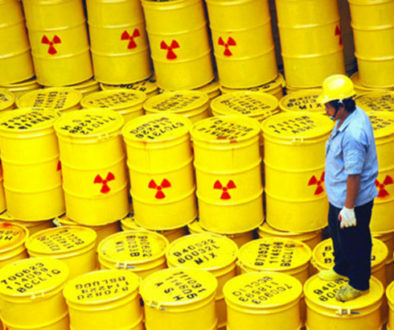 To get the plutonium out of the irradiated nuclear fuel requires “reprocessing” technology. Reprocessing involves dissolving the solid nuclear fuel assemblies in boiling nitric acid, producing large volumes of liquid high-level radioactive waste, and then chemically separating the small percentage of plutonium from the liquid solution. Once the plutonium has been re-solidified, it can then be used as a very powerful nuclear explosive material. Plutonium-239 is a major safety concern because of its high radiation levels and long half-life: 24,100 years. About 200,000 times more radioactive than the commonest naturally occurring uranium, plutonium-239 emits alpha particles as its principal form of radiation. Plutonium inhalation can cause permanent lung damage, and even death. When taken in the body, microscopic amounts can penetrate deep into the lungs and deposit, via the bloodstream, in the liver, bones, and other organs. Commercial nuclear power reactors require a nuclear fuel (usually uranium or plutonium) and a substance called a “moderator” to slow down the neutrons so that the nuclear chain reaction can sustain itself. If ordinary water is used as a moderator, the uranium fuel has to be enriched to about 3 to 5 percent U-235. This is called Low Enriched Uranium (LEU). However if “heavy water” is used instead of ordinary “light water”, the uranium fuel does not have to enriched at all. Such a reactor, called a Heavy Water reactor, can run perfectly well on natural uranium. In this way, plutonium can be produced without the need for any uranium enrichment whatsoever. That plutonium – when extracted from the nuclear fuel waste by reprocessing technology – can then be used as a primary nuclear explosive in nuclear weapons of many different kinds. By eliminating the production of HEU, and foregoing reprocessing technology to extract plutonium, IAEA can effectively close the door to nuclear weapons of any kind. They cannot produce any material to be used as a primary nuclear explosive. The nuclear world must be willing to accept far-reaching IAEA surveillance on all their nuclear facilities, including unannounced inspections by IAEA authorities. By imposing similar requirements on all nations, we could eliminate the production of nuclear weapons altogether. Then, when nuclear weapons are dismantled and the primary nuclear explosive materials are made inaccessible, a nuclear-weapons-free world would be within our reach. World peace and the abolition of nuclear weapons can never be brought about by means of a hypocritical double standard. If nuclear weapons are indeed the greatest existential threat to the continued survival of humanity and other life-forms on this planet, then no one should have them. The nuclear powers still maintain more than 15,000 nuclear warheads. A small number of them are on alert for launch. The concern for the outbreak of nuclear war due to deteriorating regional tensions is real. A recent study shows that even if only a small percentage of existing nuclear weapons are used, it would cause serious climate change and would bring the human race to the brink of extinction. The elimination of nuclear weapons is an urgent task for the very survival of the humanity. By international law and justice, weapons of mass destruction are widely perceived to be illegal. As biological and chemical weapons have been banned by international treaties, nuclear weapons should be banned immediately and made illegal. Most prominent Japanese nuclear scientists have belief in the peaceful use of nuclear energy and they advocated to Japan’s government and public that nuclear energy is completely safe. With this belief, Japan built the 54 nuclear power units in a country with frequent earthquakes and a volcanic chain. Japanese people learned from the reality of Fukushima nuclear accident that many unsolved issues continue: 400 tons of contaminated water from the Fukushima plant run into the sea every day; no repository sites have been designated for radiation waste materials; no scientific solutions regarding clean-up of the melted reactors for at least 50 years. Those eminent nuclear scientists have disappeared from the public debate on the scientific solution. 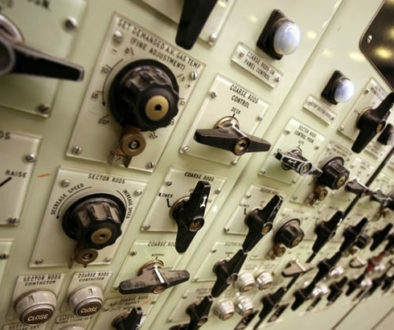 Nuclear reactor meltdowns leave radiation that lasts for centuries, and more than atomic bomb. This is to let you know of the Asahi Shimbun editorial which says that the Fukushima nuclear disaster bill will double to 21.5 trillion yen (about $188 billion). 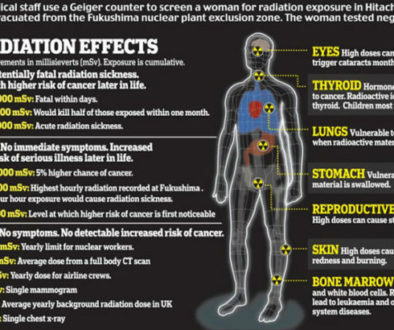 This reminds me of the opinion of renowned medical doctor, Helen Caldicott: “the truth is that most politicians, businessmen, engineers and nuclear physicists have no innate understanding of radiobiology and the way radiation induces cancer, congenital malformations and genetic diseases which are passed generation to generation. Nor do they recognize that children are 20 times more radiosensitive than adults, girls twice as vulnerable as little boys and foetuses much more so”. A secret US Atomic Energy Commission document, dated 17 April 1947, reveals that physicians were aware of these radiation hazards but simply ignored them. Under the title “Medical Experiments in Humans,” the memorandum read: “It is desired that no document be released which refers to experiments with humans that might have an adverse effect on public opinion or result in legal suits. Documents covering such field work should be classified ‘Secret'”. What are the national secrets regarding nuclear material and nuclear developments? Nothing is secret as all information available in literature, reports, and books published in the 1940s regarding nuclear material and nuclear developments. Unethical and dangerous experimentation undoubtedly continues in secret up to the present time, ostensibly under the guise of “national security”. Published in Daily Times, September 16th 2017.